England recorded their first Grand Slam. A crowd of 25,000 flocked to Twickenham to watch a dour affair in which a solitary try from the prop, Bruno Brown, proved sufficient to beat Scotland 3-0. England's winning captain was Norman Atherton Wodehouse, who later went on to serve as a gunnery officer at the Battle of Jutland, and attained the rank of Vice-Admiral before being lost at sea after a U-boat attack in July 1941, while commanding a convoy from South Africa. Warren Gatland, in his first season as Wales head coach, sealed the Grand Slam with a 29-12 victory over the French in Cardiff. Shane Williams and Martyn Williams scored the Welsh tries to secure their 10th Grand Slam - 100 years to the day after their first. Shane's charge-down try was his 41st in Tests, breaking Gareth Thomas' international record for Wales and setting him on his way to the prestigious IRB World Player of the Year award. Tributes poured in following the announcement of Mervyn 'the swerve' Davies' death. A veteran of both the 1971 and 1974 victorious British & Irish Lions tours, Davies was one of the sport's most formidable back-rows. He won 46 caps for Wales and skippered the team to the Five Nations championship in 1975 and then the Grand Slam the following year. He was widely tipped to be the favourite to skipper the Lions in 1977 but his career was cut short after he suffered a brain haemorrhage playing for Swansea against Pontypool in a Welsh Cup semi-final in 1976. England ended one of their most barren spells of all time, as Bill Beaumont's men beat Scotland 30-18 at Murrayfield to secure their first Grand Slam for 23 years. 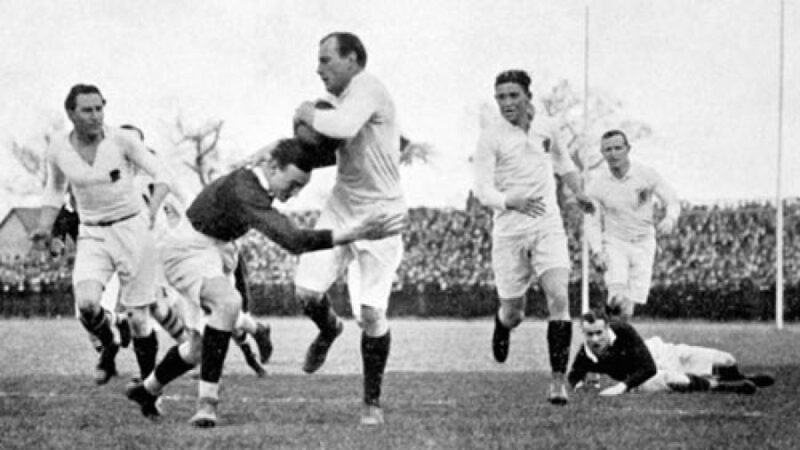 The hero of the day was the winger John Carleton, who produced England's first hat-trick since 1924, including a breakaway try to seal the contest. "I chased a Paul Dodge kick and caught it, leaving me 60 yards to sprint for the line," he recalled. "I was thinking, 'This is our day, here I am just about to score my third try in a Grand Slam game'." While England celebrated their resurgence in Edinburgh, across the pond in Dublin the curtain was drawn on a decade of Welsh dominance. Having won or led in nine of the previous 11 campaigns since 1969, their comprehensive 21-7 defeat against Ireland confirmed their return to the status of mortals. A vastly improved England cantered to a 34-10 victory over an abject France side at Twickenham, restoring some pride in themselves and ending France's interest in the Six Nations Championship. A first-half blitz from England produced tries from Mark Cueto, Riki Flutey, Delon Armitage and Joe Worsley and a 29-0 lead at the break, with France looking shell-shocked by England's marked improvement in all departments. France fought back in the second period with tries from Dimitri Szarzewski and Julien Malzieu, but Flutey's second try at the start of the second period had all but ended the game as a contest. Carston Catcheside became the first player to score tries in all four matches of a country's Five Nations campaign, as England secured back-to-back Grand Slams for the second time in 11 years. After two tries on debut against Wales in Swansea, he added another brace against Ireland in Belfast, a single score against France at Twickenham, then rounded off his season as one of three try-scorers in a 19-0 victory over Scotland, again at Twickenham. Catcheside played four more times for his country in 1926 and 1927, but never added to his tally. A forgettable trip south of the border for the Scottish centre, Charlie Drummond. Travelling down to Twickenham during one of Britain's worst winters on record, the Scots endured a long and uncomfortable train journey before taking the field on a bone-hard pitch for the Calcutta Cup. Drummond broke his collar-bone in the first-half as Scotland were overwhelmed four tries to one in a 24-5 defeat. Eric Evans, inspirational England captain of the 1950s, led his side for the last time, in a 3-3 draw against Scotland at Murrayfield. A stroll in the Cardiff Arms Park for Wales, who rampaged to their 18th outright Championship win with a 32-4 thumping of Ireland. Of the five tries scored in the performance, by far the most popular was that of the Pontypool prop, Charlie Faulkner, who was sent over the line by a textbook pass from his club-mate and front-row colleague, Bobby Windsor. The last Test on the original Cardiff Arms Park. England won 34-13, but the honour of scoring the final Test try at the venue fell to the Welsh scrum-half, Rob Howley. The Millennium Stadium emerged on the site two years later, in time for the 1999 Rugby World Cup.